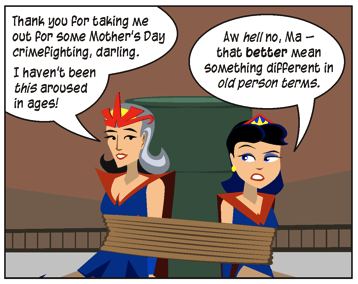 Wonderella definitely wins the prize for best Mother's Day comic this year, although the competition wasn't exactly stiff. Maybe it's because this was TCAF weekend, but I expected that some of the gag-a-day comics would chime in with some mom-themed content. Come on, guys -- don't you care enough about your moms to mock them? This got me thinking, naturally, about mothers in webcomics. I love characters like Mrs. Ning in Octopus Pie, Anja Donlan from Gunnerkrigg Court, the elder Dr. Helen Narbon in Narbonic, and, of course, Wonderella I from The Non-Adventures of Wonderella. In Evil Inc., it's key that the supervillain Miss Match is a mother; after all, it makes her secret marriage to the heroic Captain Heroic all the more dangerous. In Something Positive, Davan MacIntyre's mom Faye figured into one of the most heart-wrenching moments in webcomics. And there are moms aplenty in the diary comics. Shazzbaa lives with her mom, who seems like a wonderfully bubbly and supportive person, and these days, most of American Elf focuses on James Kochalka's family life, including his ever-patient wife Amy. But I've been racking my brain, and so far I can only think of two webcomics whose central character are mothers: Gastrophobia (mentioned earlier) and Zahra's Paradise (also mentioned earlier). The former, a screwy Greek fantasy, follows Phobia, an exiled Amazon warrior, and her precocious son Gastro. Phobia is, granted, a flawed character -- she has a nasty temper and isn't quite as awesome as she claims to be -- but she's defined largely by her motherhood and her warrior nature. In fact, in the most recent arc, David McGuire reveals that becoming Gastro's mother is, for lack of a better term, Phobia's origin story. Although Zahra's Paradise is narrated by one of the title character's sons, Zahra is really the star. The Iranian woman launches a desperate search for her other son, who has disappeared following the protests in Tehran. It's a comic about Iran, its political climate, the dangers of running afoul of its government, but it's also about a mother's anguish and determination. There are other webcomics that are peripheral to motherhood -- one half of the Anders Loves Maria duo is pregnant, and Velia, Dear (newly launched by Six Chix artist Rina Piccolo) involves a woman moving home to care for her ailing mother -- but these aren't comics about the experience of motherhood. I suppose I'm a bit surprised to come to this realization, if only because webcomics tend to cover such a wide variety of subjects. I'm far more surprised that, given the rise of mommy blogging, that we haven't seen a similar spike in diary comics chronicling motherhood. Any other good webcomics out there starring moms? Or is this one of those topics dominated by syndicated comics?